As many of you know, I recently returned from a four-month trip to Europe (I’ll post some of my photos in the Favorite Things column in due course, so keep an eye out for those). I took advantage of the long, long flight back to Australia to catch up with a couple of movies I’d missed. One was the absolutely delightful Paddington 2, and given I enjoyed Paddington 1 too, I thought the two films made an ideal subject for this month’s My Favorite Things. I first came across the Paddington books by Michael Bond in primary school where a teacher used to read the stories aloud to the class. I was immediately enchanted by the adventures of the boisterous but good-hearted bear from Peru who travels to London to find adventure and ends up being adopted by the Brown family. Much mayhem ensued (which pretty much describes the plot of the movies, too). One of the things that has always appealed to me about these stories is the inherently absurd premise and how matter of fact everyone’s reaction to Paddington’s presence in their life is. A talking bear from Peru? Well, of course! What’s strange about that? Another thing I loved about the Paddington books is that they’re a rich feast for any anglophile – and that means me. Even as a little kid, I loved the whole idea of Britishness, I suspect as a result of growing up on a diet of Enid Blyton and pony books about intrepid young English misses who triumphed with impossible horses through sheer guts and determination. 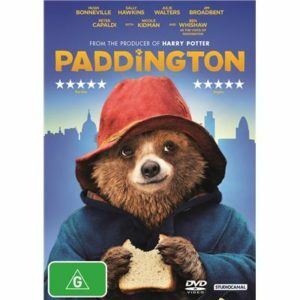 When I heard there was going to be a Paddington movie in 2014, I wasn’t sure that elusive and individual charm of the stories would translate onto the big screen. But I needn’t have worried. The moment I saw the prologue to the story which explains why the Peruvian bears speak English and want to come to London (really charming! ), I was hooked. Fast forward to Aunt Lucy putting a rambunctious young Paddington on a steamer to London and his arrival at Paddington station. The Brown family – Henry, Mary, and their two children Jonathan and Judy – take pity on the lost bear with a label around his neck which says, “Please look after this bear. Thank you.” They take him home and there are some lovely set pieces of Paddington causing chaos with his first encounters with a suburban home. 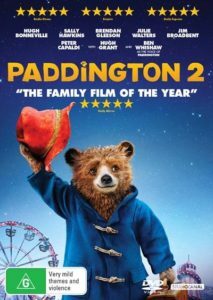 Paddington’s generous heart and courageous soul make him friends wherever he goes, although usually after some hilarious misunderstanding. This bear is definitely an innocent abroad and the resulting comedy is enchanting. I wasn’t crazy about the overarching suspense plot involving a mad scientist (Nicole Kidman) wanting to stuff Paddington and add him to her collection. It seemed a little too dark for the airy and delightful tone of the rest of the movie. Although this part of the plot lets Mr. Brown shine as a hero in his own right and also come to accept Paddington as a real member of his family. The movie is definitely worth watching despite this proviso. The acting is wonderful. A whole host of famous British actors having a wonderful time! Including Hugh Bonneville as Mr. Brown, Sally Hawkins as Mrs. Brown, and Jim Broadbent as Mr. Gruber, the kindly shopkeeper. The computer animation is excellent too – you soon start to believe Paddington is a real bear. His eyes, in particular, betray a romantic soul looking for love and acceptance. Ben Whishaw does a brilliant job voicing Paddington – the tone is just right! I’m pleased to report that Paddington 2 (2017) is an unalloyed delight. The suspense plot featuring Hugh Grant as a nefarious failed actor who makes his living playing a spaniel in dog food commercials is perfect. It’s funny, it’s just absurd enough to fit the rest of the nonsense going on around it, and nobody’s talking about killing Paddington which is a definite improvement on the first movie. All the characters from the first movie return (apart from Nicole K, obviously!) and there are some wonderful additions. Paddington ends up in jail because he’s framed for a robbery at Mr. Gruber’s antique shop. There he meets a fascinating array of characters, including Knuckles McGinty (Brendan Gleeson), the terror of the cells. Paddington’s sweetness and spirit end up making him friends even here. One of the real pleasures of this film is seeing the story go where you think it will – and then take a little twist so it all turns into magic. At the climax, Mr. Brown gets to prove his hero credentials yet again – and so does Mrs. Brown. And all ends happily. This film is so funny – funnier than the first one. I’m sure I was annoying the people around me as I chortled my way through Paddington’s escapades. The second installment devotes more time to the comic set pieces than the first one did, and I think that works to the film’s advantage. If you’re looking for a couple of real charmers, I highly recommend the Paddington movies, especially number 2. Even now when I’m writing this piece, I’ve got a smile on my face, remembering how much I enjoyed them!